I spent some very enjoyable late lunches and evenings here a few years back: I hope it's much the same. The prop books on the shelves had some genuine interest, and the staff were more than happy for me to take away some on trust, including Tom Paine's The Rights Of Man. Food and beer were both fine. Not that great, bit twee and dated. Nice range of lager and ales were well cared for, but was too hot inside, was short changed, and the urinals were all out of order. 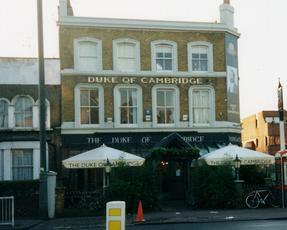 I've asked BITE to remove this review twice, as it was intended for the Duke of Cambridge Islington, not Battersea. My apologies to the proprietor of this establishment. A mixed bag, on the basis - admittedly - of just one visit. The large open space, while likely sparse if empty, was buzzing on a midweek night and had a very convivial air. The main meals looked splendid and the snacks we enjoyed (humuus, homebaked bread, etc.) were excellent. The wine selection was terrific and the sips I nabbed out of others' glasses confirmed their quality. The beer, however, was another matter. Three Pitfield beers and the St Peters Organic Best. I tried all four, but not one had decent condition - flat as the proverbial pancake. Two beers - fresh on - were soupy. I think the casks had been rushed - we're talking green beer, not stale beer. Worse, all the barstaff (there were three on, I recall) poured the beer without holding the glass but placing it below the tap on the drip tray. This means the beer falls the best part of a foot into the glass. It delivers a frothy head but knocks out condition even in a decently kept pint. With beers in less good nick, this is a real headache. I tried as delicately as I could to mention this - one always comes across as an unbearable arse when geeking out about stuff like this - but the surly reaction from one staff member was OTT to say the least.